When we speak of Jesus’ prayer, it is legitimate to put “prayer” within quotation marks. (Benedict XVI did this in Volume I of his Jesus of Nazareth). It is done when we want to highlight the uniqueness of Jesus’ prayer. It was, after all, the human prayer of the Second Person of the Trinity. But even on the purely human level, the personal union of God and man in Christ allowed his prayer to be something impossible since humanity’s fall from grace – the loving conversation of a child with his Father, as opposed to simply a creature petitioning and offering homage to his or her Creator. I think there is also a truth to be highlighted by coming at prayer from the opposite direction too – to say that Jesus prayed, and you and I “pray” to the degree that we unite ourselves to His prayer. It is in Jesus, after all, that every human action – prayer included – reaches perfection. Only He can show us what it means to be fully human, and only He can teach us what it really means to pray. 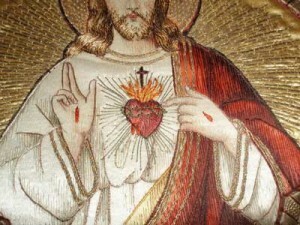 And because prayer is an activity of the heart (CCC 2562), meditation upon Jesus’ Sacred Heart will open our eyes to the startling reality of what it means to pray as a Christian. From eternity, God the Father and God the Son have been communicating themselves to Each Other in the Person of the Holy Spirit. In a never ending, perfect rush of Love, Father and Son pour themselves out to One Another. When the Son became a human being he continued to pour himself out to the Father, but that gift began to be “channeled” through a human heart – Jesus’ Sacred Heart. God the Son expressed His love and dependence upon the Father in human thoughts, displays of emotion, words, and actions. Jesus assured the apostles that, “no one comes to the Father but by me.” We do not have independent relationships with God the Father; we participate in Jesus’ relationship with the Father! We believe that Jesus wants to perfect our words and actions in this world by making them extensions of His own (we are saved by grace), and that extends to our prayer lives. [This] prayer that comes to us from Jesus is truly unique . . . On the one hand, in the words of this prayer the only Son gives us the words the Father gave him [Jn.17:7] . . . On the other, as Word incarnate, he knows in his human heart the needs of his human brothers and sisters and reveals them to us: he is the model of our prayer (CCC 2765). Jesus discloses and entrusts his Heart to us at Mass. He professes his love to us in the words of consecration and delivers himself – heart, soul, body, blood, soul, and divinity – into the arms of his beloved in Communion. The Mass makes present his sacrifice upon the Cross, “where prayer and the gift of self are but one” (CCC 2605), and it is our participation in the Holy Sacrifice of the Mass that identifies us with his Heart – “This is my body…this is my blood…Do this” (CCC 1419).